A 'UFO Sighting' Briefly Freaked Out The West Coast. There Was An Earthly Explanation. Former Arizona Gov. Jan Brewer tweeted that she was wondering what the lights over Phoenix were. For some reason, she tagged President Donald Trump. People in South California posted images of what looked like a UFO on social media. The people of Los Angeles can be forgiven if they were a little quick to jump to extraterrestrial conclusions. The government did, after all, just admit that it had spent $22 million to investigate unidentified flying objects. And after 70 years of keeping the government installation known as Area 51 under wraps, Uncle Sam conceded that, yes, it did exist, and yes, some super-secret stuff went on there. So, it's perfectly logical that Los Angelenos gazing into a darkening sky around 5:30 p.m. Friday would assume their city was in the midst of an alien invasion. 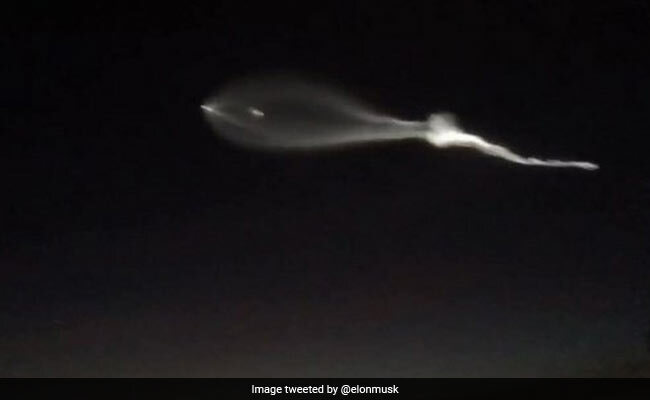 Elon Musk, the billionaire entrepreneur who ultimately wants to put people on a space-bound Megabus, fanned the flames by saying on Twitter that the jellyfish-like shape in the sky was a "nuclear alien UFO from North Korea." Southern Californians and other people out West, well, freaked out. And many, many others pointed their smartphone cameras skyward, capturing what they assumed was the first sign of the alien apocalypse - or something - and musing about the vapory lights in the sky. There was, of course, a perfectly reasonable explanation. Musk's SpaceX had launched an Iridium-4 rocket from Vandenberg Air Force Base in California - about 150 miles from the City of Angels. According to the Los Angeles Times, officials had warned that people would be able to see the launch across Southern California and elsewhere on the western half of the country. There was even a live webcast for those with more than a passing interest in rockets. But for most people, there was just confusion, awe and maybe a little bit of panic. And as Musk pointed out in the wee hours of Saturday morning, people along the East Coast can freak out next month. "If you liked tonight's launch, you will really like Falcon Heavy next month: 3 rocket cores & 3X thrust. 2 cores return to base doing synchronized aerobatics. 3rd lands on droneship," Musk tweeted. A test launch of that rocket, which Musk hopes will someday lead to missions to Mars, will launch from the Kennedy Space Center in Florida.